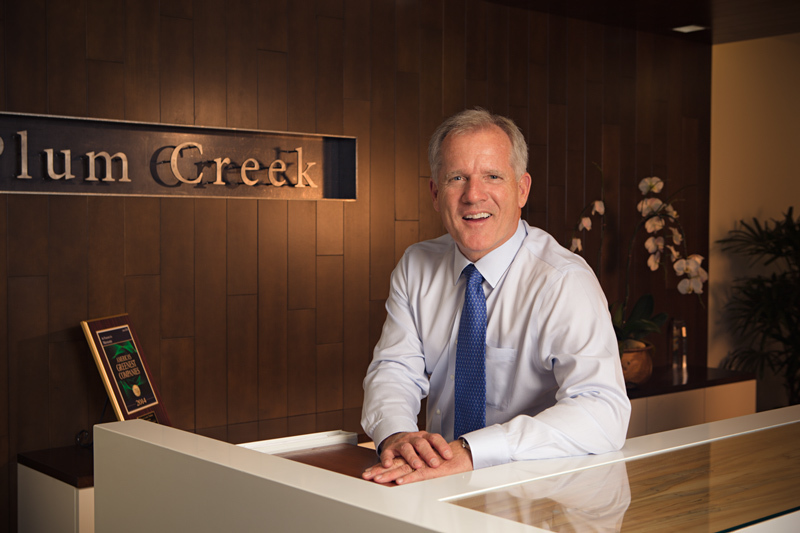 Plum Creek CEO Rick Holley explores ways to maximize value out of every acre owned. When Rick Holley joined Plum Creek Timber Company, Inc. (NYSE: PCL) in 1985 as its chief financial officer, he was new to the timber business. With a background in finance and accounting at General Electric Co., and Burlington Northern, Inc., Holley offered Plum Creek a new, outside perspective, and by 1994 he had been promoted to chief executive officer. Holley recently spoke with REIT magazine on topics ranging from becoming the first publicly traded timber REIT, the direction of timber prices, alternative land uses, and the promotion of green building practices. REIT: As the first stock exchange-listed timber REIT, do you feel there is more work to do in order to gain widespread investor acceptance and understanding of timber REITs? Rick Holley: When Plum Creek converted to a REIT in 1999, investors were quick to recognize the value of the new structure. They realized that while Equity REITs own and lease real estate that produces income through rents, timber REITs are very similar in that they own land that produces timber that takes 20 to 80 years to grow. The “rent” is collected when the standing timber is sold. Plum Creek has received widespread acceptance since it converted. Initially, about 40 percent of our shares were held by institutional investors. Today, more than 75 percent of our shares are owned by institutional investors on a global basis, with significant ownership in North America, Europe and Asia. Of course there are additional opportunities to attract more and different investors to the company and the industry. One way to do that is by helping investors understand that a well-balanced investment portfolio should include timber. Timber REITs, just like REITs that lease commercial or residential real estate, allow investors to diversify their portfolio while providing access to a significant long-term dividend yield. The trees growing on the land for as much as 80 years are real property similar to an apartment building or hotel, providing the investor with strong income growth from a renewable resource that, when held for the long term, has historically appreciated faster than inflation. REIT: Plum Creek is celebrating its 25th anniversary as a public company this year. What has been the most important development for the company during that time? Holley: Obviously, reorganizing from a master limited partnership to a REIT was a transforming event for Plum Creek. We were the first forest products company to reclassify its entire company as a REIT. We believe that the REIT structure is the most efficient corporate structure to own and manage real estate assets, including timberland. This structure enabled us to gain access to capital from institutional investors. This increased capital helped fund our growth. Since converting to a REIT, the company has continued to grow. A related and significant event in our history was in 2001, when Plum Creek agreed to merge with The Timber Company, an operating group of Georgia Pacific Corp. This merger, which involved 4.7 million acres of timberland, improved our sustainable long-term harvest profile, broadened our geographic diversity in attractive timber markets, added more than 4 million acres to our asset base, and provided a larger platform for opportunities and value growth. REIT: What is the strategic focus for the company at this point? Holley: We have four key strategies to grow asset value and cash flow: evaluate the timberland portfolio for highest value outcome; grow the value of our core timber business; create and capture value from timberlands with high-value alternative use; and maintain disciplined capital allocation. We are also focused on promoting green building because there is significant growth opportunity for using wood in commercial--mid-rise, multifamily and industrial--construction. Although wood products make up 47 percent of industrial raw materials manufactured in the United States, only 4 percent of the nation’s total required manufacturing energy is needed to produce them. Using more wood in construction benefits not only the industry, but rural communities and the environment. After all, wood is the renewable, carbon-friendly building material. REIT: Why has wood played a minor role in commercial construction up until now? Holley: Three reasons. The first is inertia. For decades, single-family homes have been built with wood, while midrise, high-rise and industrial buildings have been constructed with steel and concrete. Education: B.S. degree in accounting and business administration from San Jose State University. Also completed the Advanced Executive Program at Northwestern University. Family: Married with three grown children (two girls and a boy), six grandchildren (three girls and three boys) with a seventh (a girl) on the way. Community/Professional Activities: Serving on several private and not-for-profit boards including NAREIT, National Alliance of Forest Owners, Resources for the Future, The Seattle Times, Blethen Corp., and the Economic Advisory Council of the Federal Reserve Bank of San Francisco. Heavily involved in charity work, especially with Seattle Children’s Hospital. Hobbies: Golf and travel - especially with the entire family. Have done family trips to the Galapagos Islands, Africa and Hawaii. Favorite Vacation Spot: The Big Island of Hawaii. Close second would be Tuscany. Currently Reading: Just finished “Boys in the Boat” by Daniel James Brown and “Unbroken” by Laura Hillenbrand. Other Interests: Helping others be successful in their careers by mentoring future leaders. Secondly, until a few decades ago, the wood technology didn’t exist to safely build wood structures that had extremely wide spans or that were 10, 15 or 20 stories tall. This has changed. In many parts of the world, mass-engineered wood panel technology like cross laminated timber (CLT), laminated veneer lumber (LVL) and laminated strand lumber (LSL) are now mainstream. Finally, as society becomes more focused on sustainability, so do the design and development communities. We are all becoming more educated about how significantly we can improve our environmental footprints by choosing renewable, sustainably certified engineered wood as a substitute for products with a large carbon footprint like concrete and steel. REIT: The pace of growth in 2014 has been slower than Plum Creek originally forecasted. How have you adjusted? Holley: The primary adjustment we made was to reduce our harvest levels in markets where pricing has not recovered. The great thing about timber as an asset class, we can defer the revenue from those harvests to another day when prices are higher. As markets recover, we expect to see significant capacity expansion in the South. Significant capital is beginning to be invested there today. We are working with a number of lumber and pellet manufacturers to encourage their investment and, importantly, encourage that investment in our operating areas. As this capacity comes online to meet rising demand for wood products, pricing for our products will improve. REIT: How do you view the level of activity in housing construction? Holley: The fundamental demand for housing is on the magnitude of 1.5 million starts annually, so clearly we are underbuilding today. Here in the U.S., we overbuilt in the mid-2000s, and, for a number of years, we’ve been building at rates that are below the levels of demographic demand. This suggests that there is significant pent-up demand. We fully expect to see things recover over the next three to five years. REIT: Could you update us on the integration of the assets that Plum Creek purchased from MeadWestvaco? What impact do you expect that deal to have on your overall operations? Holley: We quickly integrated each of the assets we acquired from MeadWestvaco. While we knew that the timberlands were highly productive, we’ve been pleasantly surprised with the productivity and stocking levels. These are very attractive assets that we expect to be cash accretive in the first year of operation, and we expect the cash flow and earnings from these assets to grow over time. In addition to the timberland management opportunities on these properties, we have identified 88,000 acres of recreation lands that have values that are significantly above their underlying timber values, and we will work to realize those values over time. We are very pleased with this acquisition. REIT: Speaking of timber values, where do you see timber prices headed? Holley: We believe timber prices are headed up. However, timber prices are heavily dependent on demand for wood products, such as lumber. As the housing market and general economy improve, we will see the demand for wood products increase and log prices along with it. REIT: How do things stand internationally in terms of supply and demand for timber? Holley: High growth regions, especially China, India and other emerging markets, are unable to supply enough timber to meet their growing demand. As demand in these markets continues to grow, it bodes well for timberland owners in regions that can demonstrate sustainable management of the resource, reliability of supply, and the rule of law. North American timber markets exhibit all these characteristics. Because of this, we expect North America to continue to be a principal exporting region for global timber and forest products. The increase in global demand for forest products, whether for logs, market pulp or sawn lumber, will especially benefit timberland owners who are able to demonstrate sustainable timberland management practices. The U.S. is well positioned to benefit because no country in the world manages forests as well as they are managed here in the U.S.
REIT: Can you tell us about the investments you have been making with respect to energy and natural resources, and how they mesh with Plum Creek’s other activities? Holley: Job one at Plum Creek is to maximize the value of every acre we own, and for the most part that comes from our core timber business. However, we have developed a skill set of identifying and capturing the value of subsurface assets, such as oil and gas and construction materials. The recent acquisition of additional construction material assets allowed us to invest in a business we know, at a very attractive price and time in the economic cycle. It will generate very attractive returns for the company. That said, we are really in the land and timber business and that will be our primary focus for future investment. REIT: What level of interest are you seeing for the sale of conservation, recreation and non-strategic rural lands? How do you determine which parcels of land to sell? Holley: We continue to see interest in each of these categories. In terms of conservation, we are proud to be one of the largest purveyors of conservation in the country, having commited to nearly 1.5 million acres of land to conservation outcomes. Conservation transactions are dependent on state and federal funding, which is tight. Over the past 12 years, we’ve developed a disciplined approach to evaluating rural lands for their recreation and alternative use values. Our approach combines robust, objective market data with the expertise and judgment of our local asset managers and other experts. It’s a successful process that has allowed us to efficiently identify and realize superior values for certain properties within our portfolio. REIT: Can you explain the process for looking at possible future uses for land, as in Alachua County, Florida? How do you involve the community in the process? Holley: Our approach for identifying these opportunities is very disciplined. We evaluate market data and opportunities and engage with internal and external experts. Our Alachua project is a good example of the approach we take once we’ve identified an opportunity for a sustainable development. There, we’ve engaged members of the community including civic, conservation and educational leaders, to examine future economic, environmental and community-related opportunities. This collaborative process will result in an outcome that will benefit all parties involved. REIT: Looking ahead, what are the biggest challenges and opportunities for the company? Holley: Our number one challenge, and that of many companies, has been the slow pace of the economic recovery and the anemic pace of the housing recovery. Clearly demographics support housing starts at the 1.5 to 1.6 million level, but we remain at roughly 1 million today. Housing will recover, but it may take longer than any of us anticipated. With a housing recovery, we will experience an increase in demand for wood products, which will increase the demand for logs. At the same time, we have increasing demand for North American logs and wood products in China, India and other developing countries—this will be a positive for the industry. And Canadian supply is significantly constrained due to the pine beetle infestation in British Columbia. All in all, the future is bright for the wood products industry in the U.S.